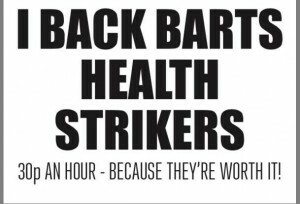 Tomorrow Saturday July 15th, hundreds of striking low-paid health workers in the East London Barts NHS Trust will be marching. Speakers include John McDonnell MP Labour Shadow Chancellor. The workers started with two days of action last week and are now in the middle of a 7-day strike. If there is no resolution by July 25th, they will begin a two week strike that day. Please come and join the solidarity demonstration to support the cleaners, porters and security guards who work for Serco, who are using agency firms to try to break the strike. The whole labour and trade union movement needs to come to their aid. The Shadow Chancellor of the Exchequer, John McDonnell MP will show his support for hundreds of low paid cleaners, porters and security guards this Saturday 15 July outside Royal London Hospital in East London.The Shadow Chancellor will express his support for workers employed by Serco at Barts Health NHS Trust who are on strike across four London Hospitals in a campaign against low pay and poor treatment. The workforce have already taken three days of strike action between 4 July and 7 July and are now on the 5th day of a seven day strike. The workers have warned Barts that they are also prepared to stage a 14 day stoppage starting on 25 July. Unite representatives will also address the rally which is expected to draw hundreds of people wishing to show solidarity with the workers. The supporters will then march to Mile End Hospital where workers are also on strike. Unite Regional Officer Ruth Hydon said: “Low paid workers who keep our hospitals clean, safe and running smoothly have shown strength, dignity and determination in their campaign for better treatment. It’s high time that Serco got around the negotiating table to resolve this dispute. 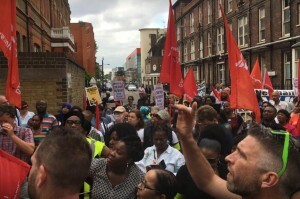 Unite members were balloted across Whipps Cross University Hospital, Royal London Hospital, St Bartholomew’s Hospital and Mile End Hospital (Newham Hospital is not involved in the strike). Serco posted profits of more than £82 million for 2016 and its contract to provide services to Barts Health NHS Trust is worth £600 million.